If you're visiting Nashville, one must-do activity is walking down Lower Broad. Also called Honky Tonk Highway, the street consists of four blocks filled to the brim with live country music venues, restaurants, and businesses. Because most buildings in this popular tourist district have some historical significance, the district was placed on the National Register of Historic Places. One would never guess that England's Queen Victoria was the one who dubbed Nashville the "Music City." In 1873, Nashville's African-American a cappella ensemble known as the Fisk Jubilee Singers performed for the queen in England. It's said that she was so impressed by their voices that they must be from the Music City of the United States. The nickname stuck and became more appropriate starting in 1892 when music began pouring out of the newly built Union Gospel Tabernacle, later known as country music's Grand Ole Opry and today known as Ryman Auditorium. The stage at this building, located at 5th and Broadway, brought country music to the masses (and was also the birthplace of bluegrass), and today Nashville's music history draws a steady stream of musicians hoping to get their start on Lower Broad. Our tour starts at 5th Avenue South, heads down Broadway to the Cumberland River, and then back up to 5th Avenue. Without stopping, it's about a one-mile, 20-minute walk to Riverfront Park on the Cumberland. 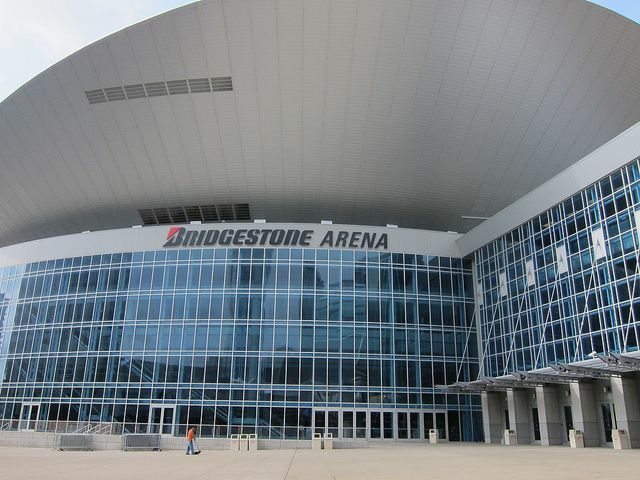 Our first stop is at the corner of 5th Avenue and Broadway at the Bridgestone Arena, which is also home to the Nashville Visitor Center and the Nashville Predators hockey team. This venue hosts some of Nashville's largest concerts and events. While at the visitor center, pick up some brochures about all the local attractions. Be sure to get a free Nashville map and free coupon books, too. As we leave the Bridgestone Arena and cross 5th Avenue, there are many fine eateries such as Rippy's Smokin' Bar & Grill. Located on the corner of 5th and Broad across from Tootsie’s Orchid Lounge, Rippy’s is a must if you want some Southern barbeque and great live music. After checking out the bands on its two levels and three stages, head to its outdoor patio for some spectacular views of Nashville. Rippy’s is a popular stop before concerts and downtown events. This block is home to the famous Ernest Tubb Record Shop. The store started in 1947 and at this location since 1951, was founded by country music's legendary "Texas Troubador," Ernest Tubb. It's the site of the Midnite Jamboree broadcast on WSM 650 AM at midnight on Saturdays. What was once Lawrence Record Shop is now Nudie's Honky Tonk. Nudie's has the longest bar in Nashville and is lined with memorabilia. Here you'll find suits made by Nudie Cohn, tailor to country superstars such as Johnny Cash and Hank Williams, Sr. Of course, there's plenty of live music. For upscale dining, at the end of the block, there's Merchants Restaurant, a circa 1870 Victorian building that once was a hotel and a pharmacy. Merchants offers plenty of mouthwatering New American and New Southern food in a sophisticated atmosphere. Continue up the block to the corner of 4th Avenue. 3rd & Broadway: Johnny Cash Museum and Harley-Holt Furniture Co.
At 317 Broadway is what once was Harley-Holt Furniture Co., ​Nashville's oldest furniture outlet that opened in 1904. Broadway Brewhouse currently operates at this site. Just off 3rd and Broadway is the Johnny Cash Museum dedicated to the career of country music's "Man in Black." This exhibit includes hundreds of Cash's personal items, costumes, instruments, artwork, and handwritten lyrics. Get a souvenir at the gift shop or take a break in its coffee shop or cafe. Our last building of interest on this block was where Harry Zimmerman opened the first of his catalog showrooms formerly known as Service Merchandise in 1960. It's currently a bar. Upon crossing 3rd Avenue, there are several more honky-tonks each offering plenty of atmospheres. At 2nd and Broadway behind Rock Bottom brewpub, you'll find Trail West. This clothier offers duds and accessories to bring out the cowboy or cowgirl in us all. Finish out the block at the Acme Feed & Seed, a turn-of-the-century establishment that sold many a bag of grain before the more localized co-op and tractor supply stores were ever thought of. It's now a 22,000-square-feet live music venue and restaurant where you'll find menu items such as Nashville hot chicken on the first floor and a sushi bar on the second floor. At 1st and Broadway is Nashville's Riverfront Park, which hosts an outdoor venue for summer concerts, an unbelievable Fourth of July fireworks display, and a docking area along the Cumberland River. Just across the Cumberland, you will see Nissan Stadium, home to the Tennessee Titans NFL football team. Off to the right, you will see the John Seigenthaler Pedestrian Bridge, which at 3,150 feet is one of the longest pedestrian bridges in the world. Walk back across 1st Avenue where you'll see The Hard Rock Cafe located in the old Phillips & Quarles Hardware Building. You can't miss the huge mural of a Gibson Les Paul Guitar painted on the front of The Hard Rock Cafe. The Hard Rock Cafe offers a palatable dinner, and of course, the ever-popular Hard Rock Nashville T-shirt and collectible pins. It offers live music and a great view of the Cumberland River and downtown Nashville. At the corner of 2nd and Broadway is the historic Silver Dollar Saloon building, which has seen a variety of businesses in its storied career, everything from a saloon to a bookstore to a gift shop. Designed by Julian G. Zwicker in 1893, it's one of the most distinctive buildings on Broadway. When it operated as the saloon, it was popular with riverboat men heading up from the Cumberland. It's known for the silver dollars ​on the floor of the bar room. It's now a multilevel honky-tonk called Famous Saloon. As we leave the 100 blocks of Broadway, we cross 2nd Avenue to enter our next block. Here we have Cotton Eyed Joe's gift shop. Also on this block are establishments that offer dining, drinking, and dancing. The venues are the perfect places to wear your Western outfits and enjoy some boot-scooting country music. As we cross 3rd Avenue, within this block you'll find good food, drinks, and live entertainment. As we cross 4th Avenue and enter our final block, you'll come to where Gruhn Guitars, the city's most famous guitar shop, was once located by the stage door of Ryman Auditorium. Now located on 8th Avenue S, it still sells, appraises, and repairs vintage American guitars. It is owned by local guitar authority George Gruhn. It is within this block that you will find most of the Lower Broad honky tonks. You can check out Legends Corner, The Second Fiddle, The Stage, and Robert's Western World. For food on this block, you must try Jack's Bar-B-Que. Hatch Show Print also used to call this block home. Now located in the Country Music Hall of Fame's lobby, Hatch Show Print's small print shop was here. It uses old letterpresses from the 1940s to produce concert and event posters. One of Nashville's oldest and most famous honky tonks, Tootsie's Orchid Lounge offers live country music all day long on its three different floors. It's a favorite place for musicians to duck into before and after their performances at The Ryman. Once you've checked out Tootsie's, go upstairs and out the back door where you will find yourself looking at the back door of the historic Ryman Auditorium, where most country music legends have performed. From 1943 to 1974, the Grand Ole Opry country music show on WSM 650 AM radio was held at the Ryman. This theater is on both the National Register of Historic Places and the National Historic Landmark list. The building was saved from demolition and after a renovation, the Grand Ole Opry returned to the Ryman's stage in 1998. It's known as one of the best venues in the country and has some of the best acoustics in the world. Whether you're coming to Nashville with a guitar and a dream or just itching to see the roots of country music, Nashville is sure to please and Lower Broadway is where you will find the heart of the music.